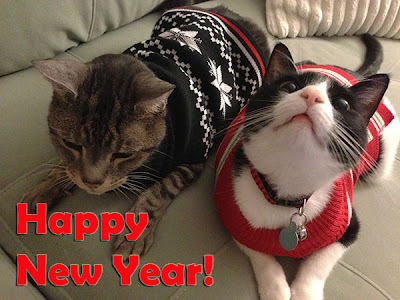 Your Daily Cute: Happy New Year, Cuteheads! Happy New Year to all of you! I hope 2013 is the most wonderful, most fabulous, cutest year yet! Oh golly, Pimp and Moo are so handsome in their new sweaters. Happy New Year to all!! Love you!!! Happy New Year to you, Pimp & Moo. Happy New Year! Lots of purrs! So cute! Happy New Year Dorian, Pimp and Moo! Happy New Year too all of you too. Tell me what those handsome boys are thinking.....is Moo moo-ngazing? Or wishing on a star? Hoping for more wonderful treats for him and Pimp. The sweaters really are gorgeous - Pimp's is very classy for a snappy dude. Happy New Year! We're purring for a great 2013! We are blessed to have these precious little furry men, and their mama in our lives. Happy New Year! May it be a new year of peace, compassion, good health and prosperity. Okay, your two furry gentlemen are VERY handsome - but do they really like their sweaters? Really? Or do they just put up with it for two minutes while you take the photos? I have to say- they don't LOOK tortured, but I feel uncomfortable with that level of anthropomorphism... it feels disrespectful of their cat-hood, or catliness or something. How do they feel about it?